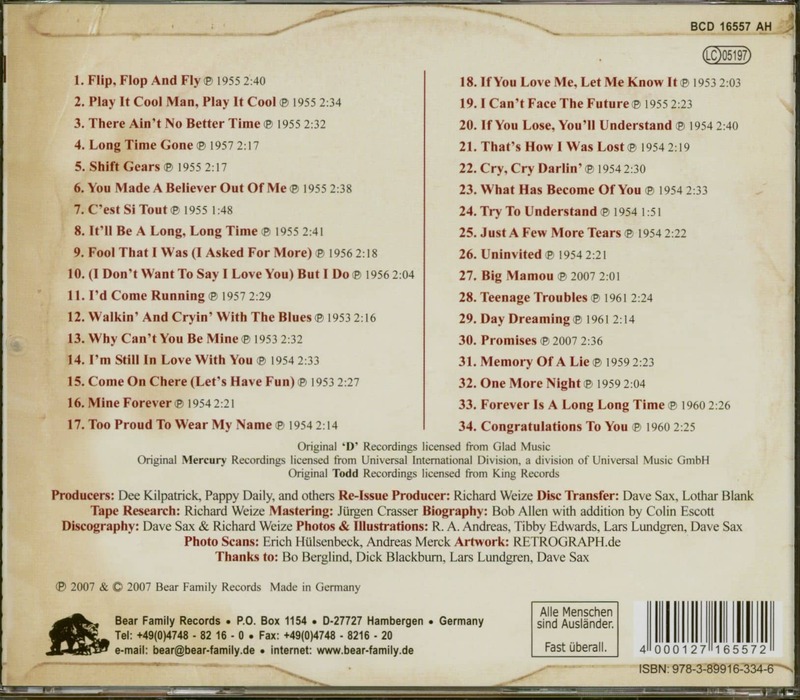 1-CD with 24-page booklet, 34 tracks, playing time 81:40 minutes. Rockabilly fans have been clamoring for his Mercury recordings on CD! The CD contains his complete recordings for Mercury, 'D', Jin and Todd. Although he charted no hits and died in obscurity, there's a cult following for Cajun-born Tibby Edwards. He was on the Louisiana Hayride radio barndance before Elvis and got a first-hand look at the birth of rock 'n' roll. Seeing Elvis, he became one of the very first country performers to really understand rock 'n' roll and declare himself for the new music. His early cover version of Flip Flop And Fly and his recording of George Jones' Play It Cool Man are acknowledged rockabilly classics. Back in 1985, Bear Family issued a Tibby Edwards LP, and now, in response to fan requests, we're reissuing it on CD… but we've augmented it with all of Tibby Edward's Mercury recordings plus his singles for 'D', Jin, and Todd. In other words, everything he ever recorded. The early 1950s was an amazingly fertile period for country music. From the cradle of Shreveport's Louisiana Hayride and from the heart of the greater Louisiana-Texas region, there emerged dozens of recording artists who would play a prominent role in shaping musical history. Lefty Frizzell, George Jones, Johnny Horton, Faron Young, Webb Pierce, Ray Price, Slim Whitman, and Jim Reeves were merely some of them. And of course let's not forget that Hank Williams, Elvis Presley, and Johnny Cash got their first break in Shreveport. Then there were those lost in the shuffle. Many far more obscure but similarly gifted singers who could easily hold their own on stage or on record with the trendsetters. These are artists who for reasons that had little to do with their actual talent had no significant commercial impact as recording artists in their time. Some of them composed noteworthy catalogues of original songs, and in some cases, made excellent recordings for major record labels, but their names are seldom mentioned today. 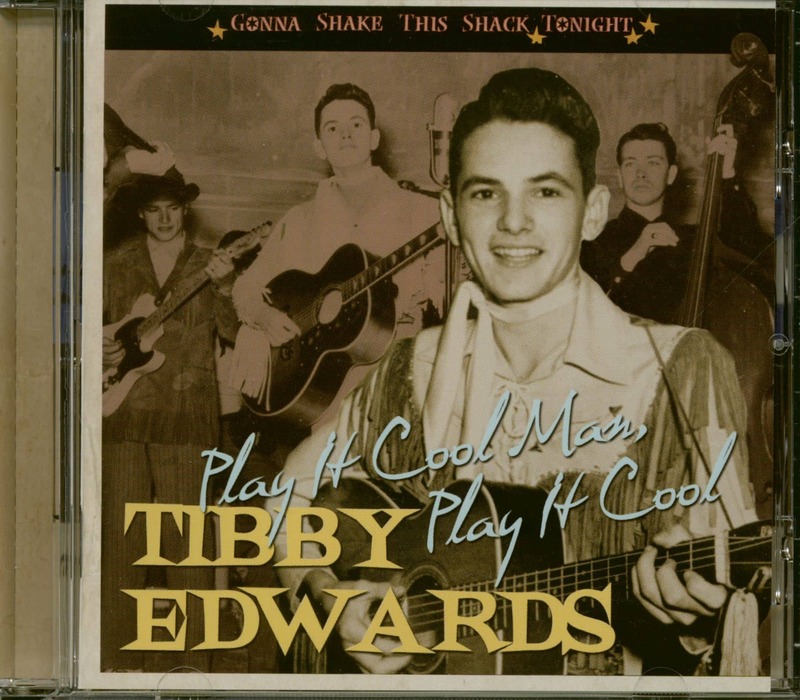 One such artist is Tibby Edwards, a man whose rich talents as a songwriter and singer were immediately recognized by his more celebrated friends and musical associates like Lefty Frizzell, Elvis Presley, George Jones and Jimmy C. Newman. He often shared the spotlight and frequently crossed paths with them in Texas, Nashville and Louisiana in the 1950s, yet somehow the magic failed to rub off. Cajun-born Edwards was a stalwart and eminently gifted singer, deeply immersed in the Hank Williams tradition and the Lefty Frizzell Texas honky-tonk style. Born Edwin M. Thibodeaux on March 19, 1935 in Garland, Louisiana, his thorough grasp of Cajun music... his native idiom... can be heard on his rollicking version of C'est Si Tout, which he composed along with his longtime co-writer, the late Leon Tassin. Throughout the following years, he moved with his family to various locales in Louisiana and Texas as his father, a construction worker, sought jobs wherever he could find them. As a teenager, he learned to sing and accompany himself on guitar. By the time he was 15 or 16, he'd fallen under the influence of Roy Acuff, Lefty Frizzell, and Hank Williams, all of whom dominated the national country charts. Around 1949, Edwards actually met one of his idols, Lefty Frizzell. Lefty recognized Tibby's talents and befriended him. For a number of years, Edwards was Frizzell's musical protege. The two of them lived together, toured extensively together, and frequently sang together on stage. "Lefty was number one back then," Edwards recalled. "For some reason or another, we got to be buddies and he kind of halfway raised me. We toured together for quite a few years. This was back when Ray Price was still his front man. A lot of times, if Lefty had a new hit out, he'd call me up on stage in the middle of his show and have me sing it. I guess he figured he could depend on me to do as good a job with it as he could!" 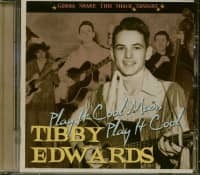 At one point in the mid-1950s, Edwards toured California and Washington state with Frizzell and appeared briefly on the legendary television show, Town Hall Party, in Compton, California, along with the show's stars, Tex Ritter, Joe Maphis and the Collins Kids. a very early George Jones original, which he first heard in Beaumont, long before Jones recorded his own version, is included here. Edwards' spirited rendition of the song clearly demonstrates his confident mastery of the Texas honky-tonk style that was prominent in Southeast Texas at the time. This song, like many of the other fast-paced cuts in this collection, also reveals his superb sense of rhythm and meter as a vocalist (later, it was George Jones' longtime musical mentor, Houston-based publisher/producer Harold W. 'Pappy' Daily, who gave Edwards generous career guidance and recorded him on the 'D' label). But it was musical entrepreneur J. D Miller who first brought Edwards and his fellow Cajun artist and longtime musical associate Jimmy C. Newman to Nashville in 1953, to audition for the Mercury label. "They took me and turned Jimmy C. Newman down," he recalled. "Looking back on it now, that may have been a mistake!" Customer evaluation for "Play It Cool Man - Gonna Shake This Shack Tonight"